My first thoughts are something plastic too close to the heat, which could also be your occasional leak. Other issues could be a nest being burnt off, or the tank being run empty. More then likely its a dirty dirty nozzle or spider webs causing improper gas air mixture. Clean things up and check the color of the flame. Bad flame due to lack of air. That is soot from lack of air. Check the mixture port and the burn chimney for an obstruction spider web or mud dauber. Yep! Adjust your flame to be as blue as you can get it. The leak and the soot are probably not related... but never say never. The soot is likely because the burner tube and chamber need cleaned. The water leak could be any number of things and you are going to have to pinpoint the leak. They make burner tube cleaning brushes and are available at R/V supply stores and online. 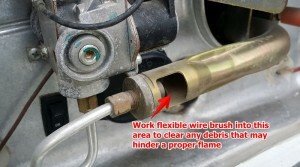 Compressed air can clean out a burner tube and chamber too. The flame adjustment usually doesn't need adjusted unless you went form sea level to high altitude. [QUOTE=nomad297;1980795]Yep! Adjust your flame to be as blue as you can get it. X3 Some sort of blockage in the air passage, causing flame to be more orange/yellow. This happens on my outside burner all the time. Video should get you through it. The leak is easy to understand. All water heaters (residential and RV) have an over-pressure/over-temperature valve, usually abbreviated as OPV. It looks like the attached photo. It's the first thing you will see, right at the top, when you open the heater door. In the winter, the water heater gets filled with cold water. When the water is heated, it expands. Fifteen years ago, the expanded volume of water would simply push back into the campground water system. But now every place has installed backflow preventers so the expanded water volume has no place to go. The pressure rises to the threshold of the OPV and it releases a little bit of water. Suburban claims that an air bubble at the top of the heater, by design, compresses enough that the OPV should not release. IMHO, the bubble is not big enough, especially if the water is really cold and the campground water pressure is on the high side. Release a little water from a tap to eliminate excess pressure. (You will still be at campground pressure.) Then dry everything around the heater. Do not run any hot water. The area should remain dry.